Visiting a foreign country for the first time brings a certain amount of dissonance: new sights, unfamiliar language, different dress – certainly unusual smells and unknown dishes, even vastly different ways of eating. 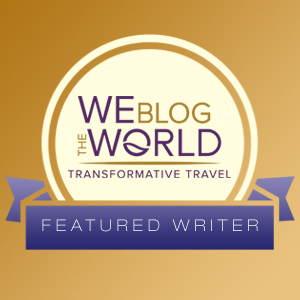 Even a seasoned traveler who has “prepped” for a new country can be thrown by incongruent sensory inputs. Even Choco Pies. Much as I’d heard and read about “the two Koreas” and had lived as a child growing up in Asia, I’d never visited. 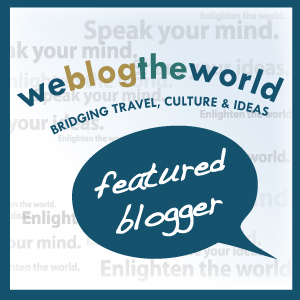 So I prepped with a variety of political and cultural sources, scoured travel guides for ideas of where to go, what to see. I could even identify a few palaces or temples in the wall murals as we walked through Incheon International Airport. Nevertheless, Korea managed to wag my tail and give me a few surprises. 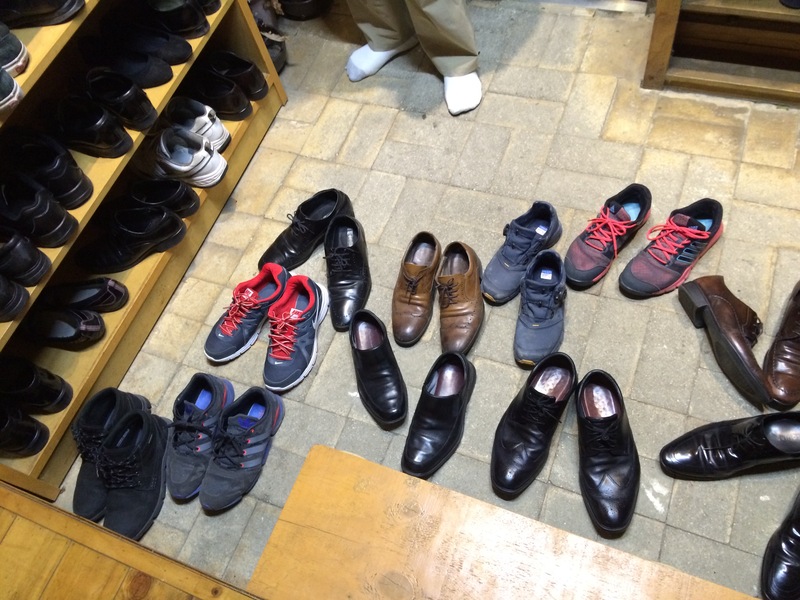 Shoe overflow from storage bins at restaurant. 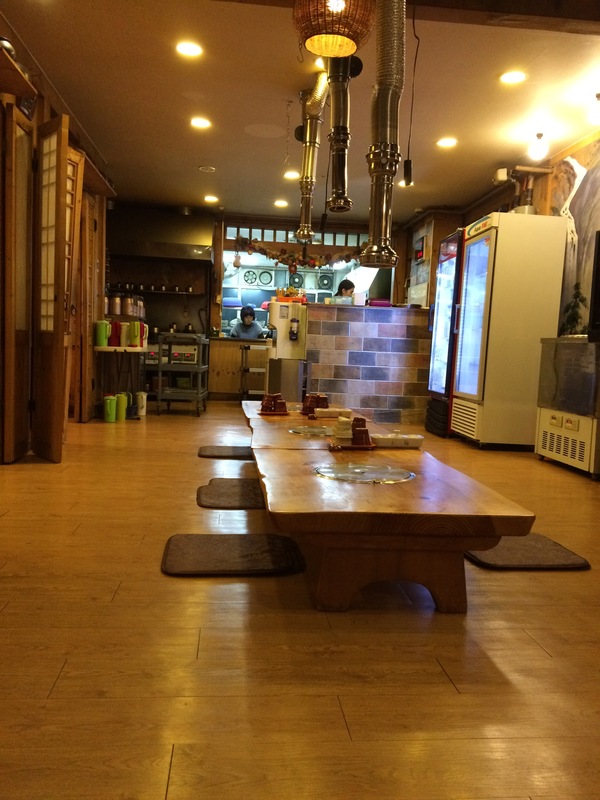 Traditional Korean restaurant. Note the flat metal disks in center of table. These are covers for the unused woks. Servers bring a pail of coals to place under wok to heat the pan for food preparation. Note the suspended air vents attached to flexible duct pipe. Clients pull down the vents over the woks when ready to cook their dinners. Meanwhile, the restaurant’s cell phone blared Für Elise with each incoming food order – and there were a lot of calls. And, nearly every person who wasn’t stuffing himself with food was staring into a cell phone – including about 7 young men who’d just been seated in one of the banquet rooms. In South Korea, which has the highest ratio of cell phones to population in the world, that’s a lot of cell phones. The combination of the non-Western restaurant ambiance and cell phones-with-Beethoven was a bit jarring. 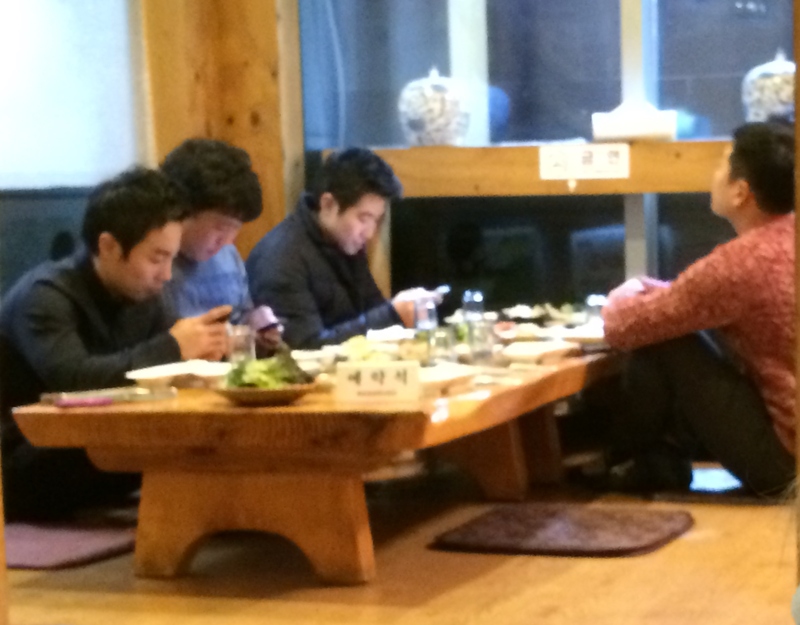 Upon sitting at this banquet table, every man began to use his cellphone. Choco pies have emerged as the most unpredictable weapon in the battle of the South (Korea) and the West (the U.S. and rest of the world) against the North (Korea). These seemingly innocuous chocolate and marshmallow confections, a rip-off of the Moon Pie (sadly, an American invention), are revolutionizing the North. First introduced 10 years ago to North Korean workers as a form of wage compensation at a North-South joint venture factory in Kaesong, Choco Pies were sold or bartered by the workers for other necessities in the North. Hoarded then resold at exorbitant prices on the black market, fetching as much as $10 apiece – a veritable fortune in the impoverished North – Choco Pies became a dominant form of “currency,” and turned the North Korean economy on its ear. The response of the North Korean government was predictable: Kim Jon-un, beloved, third-generation dictator, has banned Choco Pies. The story behind the Choco Pie is so wonderfully a combination of capitalism and Korean culture and politics. A visiting Korean businessman fell in love with Moon Pies in a visit to the U.S.; this gustatory rapture spawned an “Ah ha!” moment, and by 1974 the Orion Company was manufacturing the confection in South Korea. 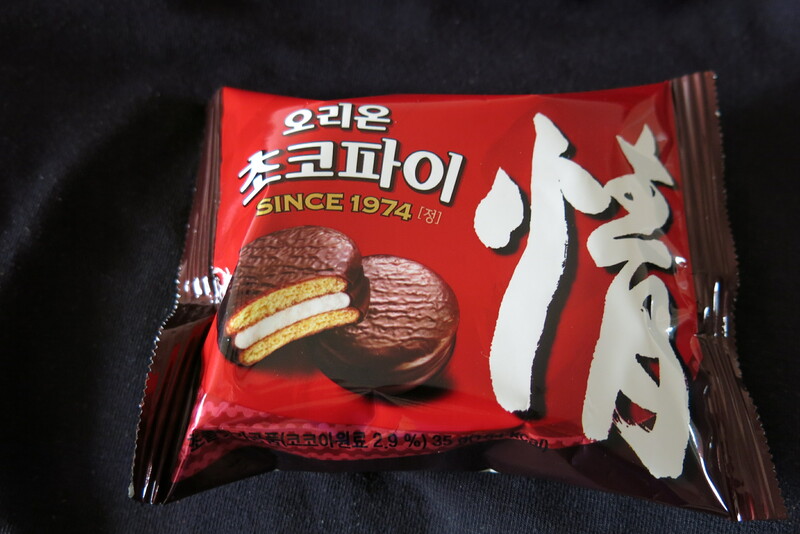 Called “Choco Pies” in attempts to ward off yet another round of patent infringement accusations from Best Bud U.S., these chocolate-covered cookies with a marshmallow filling became a huge hit among South Koreans. 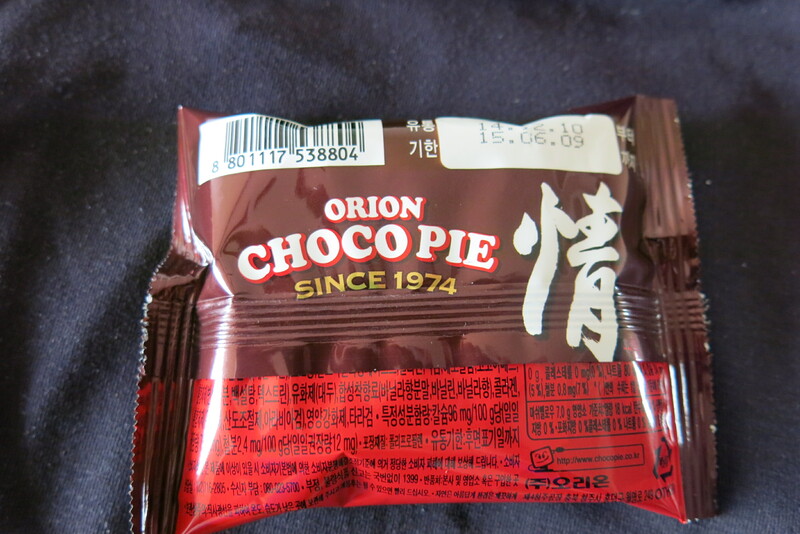 Choco Pie, the brain child of Orion. Sound like “Oreo” to anyone? Spin the dials forward to 2004: the two Koreas agreed to a joint manufacturing-industrial venture in Kaesong, NK, with the North supplying the labor and the South the facilities and managerial know-how. Assuming that women were more easily controlled than men, the Pyongyang (Northern) government selected almost exclusively women to work in these factories (a big mistake, as it turned out), with strict limitations on the amount of exposure and interchange with the South Korean personnel. Moreover, the North wouldn’t allow the South to pay the workers directly, requiring the wages earned be remitted to the North to then be distributed to the workers. However, the Pyongyang government only paid their people about two-thirds of their earnings. The Southern managers began using Choco Pies as bonuses and incentives in 2005, and as the workers developed a taste for the treats, increased the number of cookies per day to as many as 20 per worker. The women began to realize that if they loved the Choco Pies, their literally famished compatriots would as well. Thus began the illicit Coco Pie black market that nearly ruined the North Korean economy, such as it had devolved. Within five years, Pyongyang had denounced Choco Pies and closed down their “cooperative” involvement in the Kaesang experiment. By 2014, Kim Jong-un had banned Choco Pies. 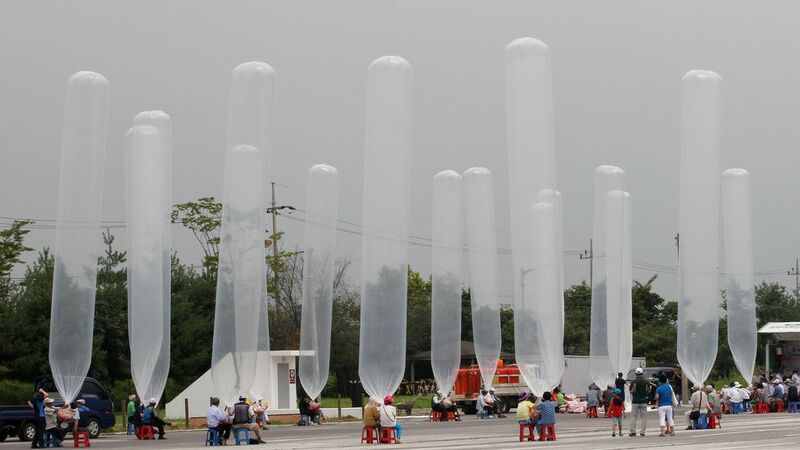 I can’t really imagine how horror-struck the retro hard-line government of Pyongyang must have been, seeing hundreds of helium condoms floating over North Korea, raining thousands of Choco Pies. If only South Korean ingenuity can be properly matched with Western dollars or euros or yen and plenty of Choco Pies as ammunition, there finally might be a downfall of the most repressive government existing today.One can only hope. Who’d’ve thunk it? Choco Pies. Note: The whole Choco Pie story is real. Just Google this confection and you’ll find it all. If you’re interested about how the North Korean government operates and still manages to exist, read The Impossible State: North Korea, Past and Future by Victor Cha. The coda to this tale is that once in Korea, I embarked on a quest for a Choco Pie. One disgusting bite later, I had a hard time understanding Koreans’ fanaticism for this “treat.” Michael, on the other hand, finished it off, no problem. I think I’ll leave Choco Pies to the Koreans.